Each autumn the Cape May Monarch Monitoring Project hires one or more seasonal biologist to help with the project. We normally don't announce this position nor begin to evaluate applications until summer, but if you or someone you know might want to work with us next fall, we'd be happy to accept their application at any time. Here is the position description from last year; it's unlikely anything will be changed for 2014. INTERN (1) to assist with ongoing Monarch butterfly migration project at New Jersey Audubon’s Cape May Bird Observatory, Sep. 1 - Oct. 31. 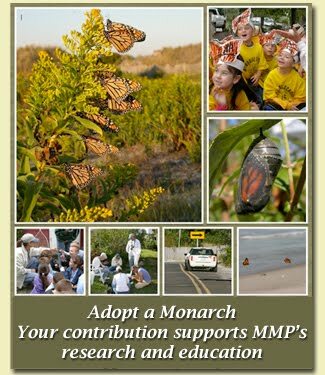 Duties include daily road censuses of migrating Monarchs, tagging, data entry, and educating the public about the project and Monarch biology. Successful applicant will be expected to work long hours during peak Monarch flights, shorter hours during lulls. Careful data collecting and entry skills, and excellent interpersonal skills a must; familiarity with insect ecology and migration a plus but not required. Must have own vehicle. Salary $800/mo. ; housing and reimbursement for gas provided. Send cover letter indicating position of interest, resume outlining relevant experience, and three references (including email addresses and phone numbers) to MIKE CREWE, New Jersey Audubon’s Cape May Bird Observatory, Northwood Center, 701 East Lake Drive, PO Box 3, Cape May Point, NJ 08212 or email: mike.crewe@njaudubon.org. Applications accepted until positions are filled. NJ Audubon is an equal opportunity employer.